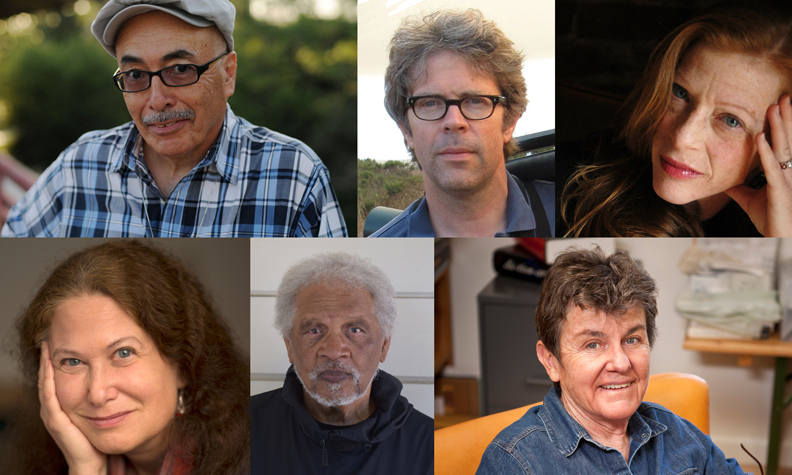 Presenters included (clockwise from top left) United States Poet Laureate Juan Felipe Herrera; best-selling novelist and author of Purity, Jonathan Franzen; New Yorker staff writer and author of The Orchid Thief, Susan Orlean; acclaimed poet and former United States Poet Laureate Kay Ryan; writer and activist Ishmael Reed; and renowned poet Jane Hirshfield. Other featured authors included Benjamin Percy (The Dead Lands, Thrill Me: Essays on Fiction); Solmaz Sharif (Look); Matthew Zapruder (Sun Bear,Come On All You Ghosts); C. Dale Young (The Halo, Torn); Bich Mihn Nguyen (Pioneer Girl, Short Girls); and many others. Participating publishing professionals included Jordan Bass (McSweeney's) and Rusty Morrison (Omnidawn Publishing); and agents Danielle Svetcov (Levine Greenberg Rostan Literary Agency), Anna Ghosh (Ghosh Literary), and Jennifer March Soloway (Andrea Brown Literary Agency). A Lit Mag & Small Press Fair allowed participants to meet representatives of more than a dozen outstanding presses and literary magazines, including: Eleven Eleven, Fourteen Hills Journal, Hexagon Press, Manic D Press, McSweeney’s, New American Writing, Nomadic Press, Outpost19 Books, Reed Magazine, Sixteen Rivers Press, Switchback Journal, Timberline Review, Two Lines Press, and ZYZZYVA.